The “Need to Know” airlines series for family travelers continues with these important tips for families flying China Airlines with a baby, toddler, or young children (and even if your kids are no longer babies or toddlers, don’t miss the new Family Couch seating tip and photo below!). UPDATED FOR 2018. China Airlines generally offers a 25% discount for children from 2 to 11 years and infants flying in their own seats, which can make a big difference in your family’s bottom line. If you have a choice between China Airlines and a U.S.-based carrier, definitely compare the total ticketing price for your whole family–not just the advertised fare. Click “More Advanced Options” in the search box to enter the ages of your children and your preferred airline (eg. China Airlines). Buying Tickets for Your Infant/Lap Child (less than 24 months, no seat): Good news! You can now purchase international tickets for a lap child on China Airlines’ website, as well as international tickets for a lap child flying China Airlines on both CheapOair.com and OneTravel.com. In most cases, the lap child’s fees for international flights will be 10% of the applicable adult fare plus taxes and surcharges. If you need to book your family’s tickets through the China Airlines’ site, be sure to call their reservation number soon afterward to let them know you will have an infant traveling with you, and make any additional requests for the lap child, such as an airplane bassinet or baby meals / kit. China Airlines Bassinets on Long-haul Flights: Baby bassinets (AKA skycots) are also available, but do be sure to call reservations well in advance to make your request and ensure you have the necessary seating positions to take advantage of these. Recommended reading: Five Things You Should Know Before Flying with an Airplane Bassinet (AKA Skycot). The North American reservations phone number for China Airlines is 1-800-227-5118, and worldwide reservations numbers can be found here (use the drop-down menu for the region you need). Lap Child / Infant Baggage Allowance: China Airlines allows one complimentary small checked suitcase weighing up to 22 lbs. (10 kg.) for each lap child, plus a fully collapsible stroller for no extra cost. 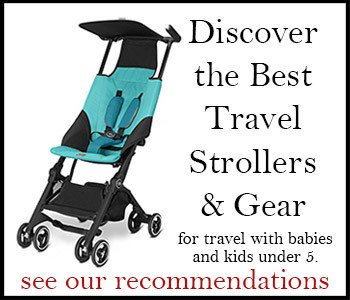 See recommended Lightweight Travel Strollers here. China Airlines has no unusual conditions for using car seats on its aircraft other than they don’t want children over 40 lbs. using them. They may check to see that your child’s car seat is tested and certified in the country of its manufacture, so be sure you are ready to point to the label if needed. Families can also take advantage of China Airlines’ children’s meals, baby food, toys, and baby care kits with diapers. Call reservations well in advance to request child or baby meals and care packages: 1-800-227-5118. Sadly, China Airlines discontinued the “family couch” option in economy classes on June 1, 2018. To ease sleeping (and prevent dangling / antsy legs in flight, I suggest you take a look at the Kailefu inflatable travel footrest for children. Flying solo with your child? Don’t forget you’ll need a letter of consent for international air travel with only one parent or guardian (follow link for sample letter). You might also want to read Fifteen Tips for Flying Solo with a Baby. Traveling with school-age children? Be sure to check out the latest posts for travel advice and inspiration over at our sister site Family Travel 411. Excellent tips./ LOVE that couch option! This is very informative post. People planning to travel for first time in China Air will find this helpful. Especially if they need to travel alone with a baby they must prepare themselves in advance. I’m actually getting ready to fly with China Air, and these tips are so useful to me. I’m definitely going to look in to these family couch seats. Great, Valerie! Let us know how it goes if you try them! Safe journey!